This obituary was published on page 2 of The Tuscaloosa News on Wednesday, March 12, 1969. 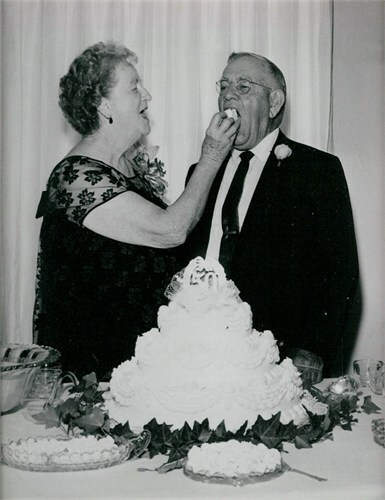 This photo of my grandparents, Virginia “Virgie” Doughty Hughes and Arley Hughes, was taken at their 50th anniversary celebration in 1967. Arley Ezra Hughes, 78, of 1519 Fifth Ave., died this morning at Druid City Hospital. A native of Pickens County, he had lived in Tuscaloosa for 50 years. Mr. Hughes was a graduate of the University Law School in 1916 and worked for many years with the Alabama Power Co. here. Funeral services will be held at 10 a.m. Thursday at the Strickland-Hayes Chapel with the Rev. Allan Watson officiating. Burial will be at Evergreen Cemetery. The body will lie in state in the funeral home until servicetime. Surviving are a daughter, Mrs. C.C. Davis Jr. of Marietta, Ga.; two sons, H.L. and A.E. Hughes Jr. of Mobile; seven sisters, Mrs. Naoma Ashcraft of Tuscaloosa, Mrs. Floy Patterson of Columbus, Miss., Mrs. Pluma Franks of Columbus, Mrs. Dorothy Hill of Philadelphia, Miss., and Mrs. Annie Mae Sanders of St. Petersburg, Fla.; three brothers, Eli Hughes of Tuscaloosa, Charles Hughes of Columbus and Auvin Hughes of Marietta, and nine grandchildren. Active pallbearers are Lee Hughes, Charles Davis, Larry, Mark, Lowell and Howard Hughes, Robert and Johnny Doughty. Honorary pallbearers are Roscoe Gibson, Wilburn Christian, Ed Mathews, Glenn Partrich, Joe Brown, Alton S. Shamblee, and the adult men’s Sunday School classes of Calvary Baptist Church. Glenn, Naoma Ashcraft (my grandfather’s sister) is buried at Ashcraft Corner Cemetery — the same cemetery where Elton and Murlee Holliman are buried. Glad I’m on your list to read this.